The eNotes Blog: New Film, Old Debate: Did Shakespeare Truly Pen the Works That Bear His Name? On October 28, the new film Anonymous opens in wide release. 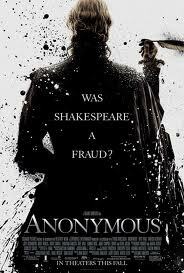 Anonymous is a political thriller which postulates that the true author of the works we attribute to William Shakespeare was, in fact, Edward De Vere, the Earl of Oxford. The political backdrop is that of the succession of Queen Elizabeth and the Essex Rebellion that sought to keep her from the throne. The idea that Shakespeare is not the author of all of his work is nothing new. In fact, such theories date to the middle of the nineteenth century, when the author’s reputation reached god-like status. That adoration led to a backlash. Murmurings began that someone with such a humble background could not possibly have been capable of such eloquence, and could not have possibly, given his station in life, known so intimately the workings of the court. There have been numerous candidates championed as the “true” authors at various times over the last two hundred years, including Francis Bacon, Christopher Marlowe, and the movie’s focus, Edward De Vere. Personally, I think the whole thing is poppycock and would cheerfully throw a few insults at the beef-witted wagtails who are dredging this up again (Like that last bit? Get your own Shakespearean insult here). But I will try to suspend my disbelief and attempt to enjoy the movie for the political thriller it purports to be.